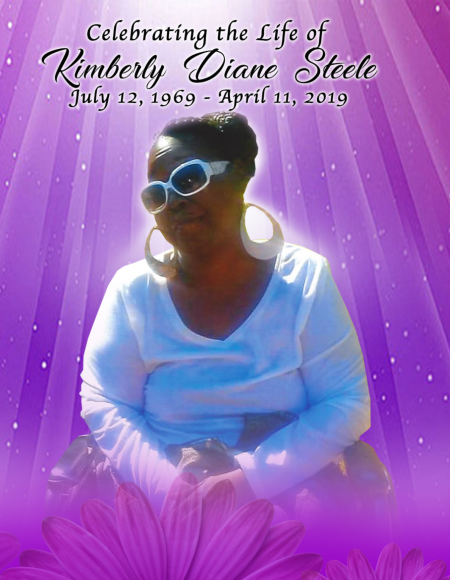 Kimberly Diane Steele, 49, passed away on Thursday, April 16, 2019. Kimberly Diane Steele was born on July 12, 1969 to the late JoAnne Steele and Robert Dixon. She passed away peacefully on Thursday, April 11, 2019, at her residence in Charlotte, North Carolina. In 1988, she graduated from Myers Park High School. Kimberly was formally employed with the Childcare Network. Kim as she was affectionately called, accepted Christ as her Lord and Savior and was afflicted with Glory Chapel in Mooresville, NC. In her leisure, she enjoyed shopping, traveling, and eating at restaurants. She was a loving mother and grandmother. She always in good spirits. In spite of her condition, she lived life to the fullest doing the things she enjoyed doing. She was survived by one daughter, Kiara Steele (Laronte); two sons, James Harris (Ashley) and Eddrick Steele (Brittany); fifteen grandchildren, Jamauri, Jaylen, JaNiyah, Deonte’, Keonte, Christian, Elijah, Ja’Zariah, Jamillion, MaKahla, Jordan, Jaishaun, Chance, Chase, and MaKynzie; a devoted fiance, Maddison Davis; sisters, Robin Steele, Lesia Dixon, Tywanda Dixon, and Felicia Cooper; one nephew, Anthony Steele (Amber); three nieces, five aunts, one uncle, two longtime best friends, Montina Bardlavens (Nikki) and Pamela Phillips; and a host of other loving relatives and friends. A viewing for Ms. Steele will be held from 6:00 PM - 8:00 PM, on Friday, April 19, 2019, at Boston's Mortuary 4300 Statesville Road, Charlotte, North Carolina 28269. A funeral service to celebrate the life of Ms. Steele will be held on Saturday, April 20, 2019, at Boston's Mortuary. The visitation will begin at 5:00 PM and the funeral service will begin at 5:30 PM. The Steele Family have entrusted arrangements to Boston's Mortuary. There's still time to send flowers to the Visitation at the Boston's Mortuary Chapel from 5:00 PM to 5:30 PM on April 20, 2019.